When its the end of the week and there’s nothing that I could find in the refrigerator, I’m sure most of you rely on eggs just like me 🙂 . That’s one thing surely available in the pantry for quick-fix days when I run out of all other options. 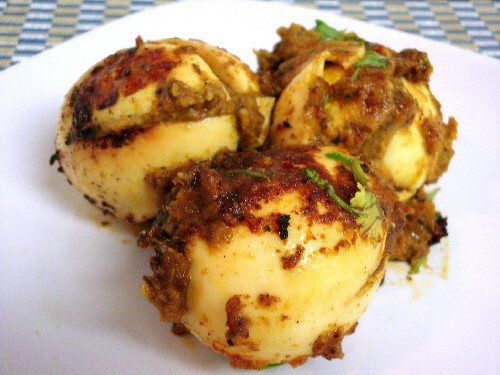 Browsing through my recipe file, I realised I have’nt blogged this favorite egg recipe so far. It could be served as an appetizer with sliced red onions and lemon wedges on the side or eat it along with hot rice and dal, no matter what you choose the taste is delicious. Now, to the recipe…..
Bring water to boil in a deep sauce pan and slowly place the raw eggs with a slotted spoon. Allow to cook for about 10-12 mts. Turn off the stove. Let it cool until you can handle. Peel off the shell and set the boiled eggs aside. Alternatively you can place the raw eggs in a pressure cooker with a cup of water and cook for 1 whistle. Allow the pressure to go off, remove the lid and when cool enough to handle peel the shell off. Heat 2 tbsps oil in a pan, and on medium flame add curry leaves. Let it splutter then add shahi jeera, cloves, cinnamon, coriander seeds, pepper corns and cashew nuts. Fry them for about 2 mts or until the cashews start turning golden brown. Take care not to burn the spices. Adjust the flame according to your stove. Add ginger & garlic paste, chopped tomatoes and cook covered for about 3-4 mts until the tomatoes turn soft. Add chilli powder and combine. Turn off the flame and allow to cool then grind into paste without adding any water. Now take the eggs, add a pinch of turmeric and apply on all of them then make a slit on the top of each egg just like you do for gutti vankaya (brinjal curry) recipe (4 cuts on the top). Arrange them all on a plate then gently using your fingers stuff the paste inside each egg as much as you can. Set aside the remaining paste. Heat remaining oil in a pan, and gently slide in the stuffed eggs into the pan. Add remaining paste if any and allow the eggs to fry on medium heat until the eggs start browning or turning crispy on the outside. Adjust salt if required. Add freshly chopped coriander leaves just before turning off the flame. Serve it with hot rice and dal or as an appetizer with sliced red onions and lemon wedges. Love your recipes. 2questions 1) Cashew is not mentioned in ingredients. How many should I add. 2) Do I add whole coriander seeds or Powder. Thanks for letting me know. updated the post with the measurement for cashew nuts. 2) I used whole coriander seeds in this recipe and not coriander powder.